Facing a $5 million budget gap for the coming year, Chemeketa Community College is planning to cut 33 positions, including laying off seven employees. 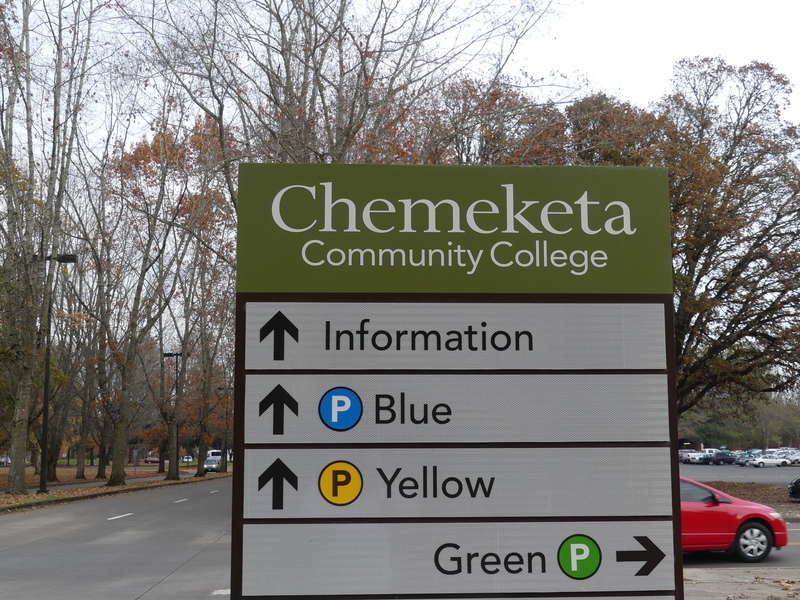 Responding to declining enrollment and revenue, Chemeketa Community College is planning to cut 33 positions, including laying off seven employees for the 2019-20 school year. The announcement comes after the college’s board voted to raise tuition and fees by $10 per credit in February, the largest such increase in over a decade at Chemeketa. Chemeketa President Julie Huckestein announced the decision to college staff in an email late last week. “I recognize the impacts of these decisions and do this with regret and sadness for those individuals, their families and their co-workers,” she wrote in the email. The cuts are based on an assumption the state will dedicate $590 million to Oregon’s community colleges for the 2019-2021 biennium. That would represent an increase from the $570 million appropriated for 2017-2019. The Oregon Community College Association has asked the Legislature to instead approve $787 million in funding, including $70 million for career and technical education programs. Huckestein said the college was projecting a $5 million budget deficit for next year. The tuition and fee increase will cover about half the gap, she said. Cutting payroll will make up the remainder. All 33 jobs being eliminated are at least half time, she said. College administrators worked with department directors and deans to identify positions to cut, which include 12 faculty, 12 classified staff and 12 managers. The seven people being laid off include one grant-funded faculty position, four classified support staff and two managers. Other than the grant-funded position “we don't believe this will impact direct instruction to students,” Huckestein said. Huckestein is retiring at the end of the school year. Her successor, Jessica Howard, will begin work July 8. The college has about 700 full-time employees, and about 2,000 workers total, which includes students with on-campus jobs, she said. The seven employees losing their jobs will serve through the end of June. They were told last week they were losing their jobs. Huckestein declined to say which positions were being eliminated, but said college leaders decide whether to fill a job each time a Chemeketa employee resigns or retires. Specific positions cut will be announced at an April budget meeting, she said. If a teacher belongs to a department with low enrollment in courses, that position would often be left unfilled, she said. Terry Rohse, the president of Chemeketa’s classified employees association, said many of the unfilled positions cut are jobs where workload increases with enrollment, like classroom aides. Many have been vacant for up to a year as enrollment has fallen, he said. “Since we’ve been operating without them for a while it was felt we could just go ahead and not fill them,” he said. Filled jobs will be harder to manage without, Rohse said. He declined to identify specific jobs that were being eliminated, but said the expectation is that the remaining employees will pick up that workload. Kisha McIntosh, a half-time department technician at Chemeketa’s Polk Center, is among the seven being laid off. She helps run the office at the center, which serves students in Dallas. “This is going to be hard for us to absorb. I do quite a bit in the five hours a shift, four days a week. And we’re already feeling like we could use another person and now they’re going to have to go without,” she said. The college’s enrollment was down just one percent in the fall, giving leaders hope that years of decline might be starting to stabilize. But Chemeketa’s full-time enrollment for winter term was down five percent from last year, Huckestein said, necessitating further cuts. The college currently has 3,050 full-time students, she said, and 14,255 total students. Loss of students means less revenue from tuition and from the state, which gives colleges a set amount per student. And staffing costs rise every year because of negotiated wage increases and the growing costs of funding the Public Employee Retirement System. Rohse said he appreciates the college giving staff months of notice and time to look for other jobs. “I think they’re doing a good job under the situation we’re under right now. It’s hard on all of us to let people go,” he said. Kaitlyn Wimmer, a journalism student at Chemeketa Community College and editor-in-chief of the Chemeketa Courier, contributed reporting. This article is part of a partnership between the Courier and Salem Reporter.